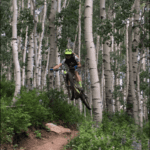 Gunsight Trail is a newly built trail (as of June 2015) that offers up a longer descent through as extensive aspen forest with swooping switchbacks, and fast flowy turns. Start by riding Lupine Trail out to near where the 2nd main singletrack starts, but instead of taking a left off the doubletrack stay on the doubletrack and keep climbing. Eventually, there will be a singletrack to your left and the start of the Gunsight Trail. Enjoy the fast and flowy downhill through pristine aspen groves. Toward the middle, you’ll find yourself on a short but pumpy climb through a few switchbacks, but the downhill soon resumes for a fun and fast descent toward the bottom. Michael is here to protect your rights and freedom, since 1998, with the knowledge, skills and experience acquired during 8 years of service in the United States Air Force as a Judge Advocate General and as a Special Assistant United States Attorney in Colorado, Texas and Wyoming. Michael’s knowledge in prosecuting and defending numerous military and civilian cases over the past 15 years serves his clients well both in and out of the court room. Michael and his team are dedicated to answering all of your questions, returning your calls in the timeliest manner possible and strive to make sure you are as comfortable as possible through what can be a very stressful and confusing process. In fact, Michael's clients have nearly 24 hour access should an emergency arise.